In this study, we report on a case of transdermal paraquat poisoning combined with Pemphigus Vulgaris (PV). The patient was a 68 year old male farmer. He was exposed to paraquat (50% concentration) in a closed environment for 3 h, when the skin and respiratory symptoms of paraquat poisoning occurred. He was admitted to the hospital and diagnosed with transdermal paraquat poisoning combined with PV. After symptomatic treatment using glucocorticoids, immunosuppressive agents, and antibiotics for more than 3 weeks, PV was controlled, and the patient was discharged. Exploring paraquat as an agent in the etiology or induction of PV and its pathogenesis are worthy of further investigation. Pesticide poisoning is one of the major public health problems in developing countries, with approximately 2 million people hospitalized due to pesticide poisoning each year and even higher annual hospitalization and mortality rates . Paraquat is a widely used herbicide, and is fatal when absorbed by the body. Paraquat Poisoning (PP) accounts for 34% of all pesticide poisoning cases, and is associated with the highest mortality . Paraquat can be absorbed through the skin as well as the gastrointestinal and respiratory tracts, and systemic toxicity can occur from either long-term exposure or short-term exposure to high concentrations on the skin, particularly broken skin, scrotum, and perineum. Pemphigus vulgaris (PV) is an autoimmune disease characterized by skin or mucous membrane blisters, but the specific cause is still unknown; other factors such as genetic and environmental factors are likely to cause this disease . The pathogenesis of PV is clearly related to immunity; however, the precise immune mechanisms of the occurrence and development of PV are still unclear. It has not been reported whether skin absorption-induced PP can induce or cause PV. This study reports on one case of skin absorption-induced PP with PV, in which both conditions were controlled after appropriate and effective treatment. The relevant mechanisms are also discussed. The patient was a 68 year old male farmer, who was hospitalized for a 2 month skin itch and ulceration due to paraquat exposure. This study was conducted in accordance with the declaration of Helsinki. This study was conducted with approval from the Ethics Committee of Shandong University. Written informed consent was obtained from participant. Two months prior to hospitalization, the patient had sprayed paraquat (approximately 50% concentration) using a knapsack sprayer while in an enclosed greenhouse (temperature ≤ 28°C) for an operating time of approximately 3 h. The length, width, and height of greenhouse were 60 m, 6 m, and 2.6 m, respectively. The volume of water diluting Paraquat was about 150 L. The patient used no protective measures (e.g., no mask or hat), and his limbs, face, and neck were exposed to the air. In addition, he did not wash his exposed skin after the job. On the second day, the patient felt somewhat nauseated and fatigued, with a burning sensation in his oral mucosa, pruritus, and slightly red skin on his entire body, but he did not seek medical attention. One week later, the patient felt obvious breathlessness and had pruritus with scattered blisters and presented at a local hospital. After receiving symptomatic treatment at the hospital, his symptoms momentarily changed from improvement to aggravation, and no clear diagnosis could be made at that time. The results of a chest X-ray performed at the hospital showed slightly thickened pulmonary markings, and his oxygen saturation and biochemical indexes were normal; thus, PP-induced skin lesions could not be precluded. Subsequently, the patient was admitted to our department. The physical examination on admission revealed that the patient’s oral mucosa, as well as the skin on his head, chest, and back, had soybean-sized (approximate) blisters and erosions, with slightly turbid blister fluid. Figure 1 displays a flushing erosive surface on a site of a ruptured blister, together with minor exudate or crusting. The patient's family members stated that his wound healing was slow and recurrent and he felt burning pain. Bilateral pulmonary respiration sounds were noted; however, the other results of the physical examination were normal. Computed Tomography (CT) of his lungs showed bilateral lung legions (Figure 2). The patient was previously healthy, with normal liver and kidney functions, and he had no history of skin disease or other immune system disease. He did not have contact with other chemicals or radioactive substances before and after PV onset. In addition, no problems were detected during a physical examination 2 months before PV onset, and on this basis, other immune system disorders were ruled out. In addition, no similar disease had occurred in any of the family members of the patient. Figure 1: Exudate and crusting on partial back skin. 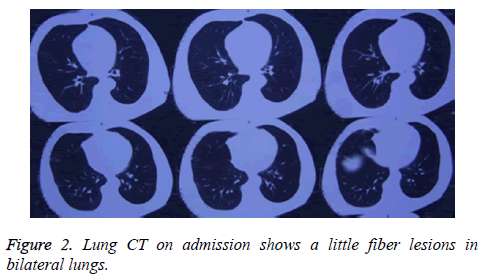 Figure 2: Lung CT on admission shows a little fiber lesions in bilateral lungs. Following admission to our department, a smear of the basal tissue fluid of a fresh blister from the patient was taken for pathological examination and staining. It exhibited separated or clumped lytic free acanthocytes, with large and uniformly stained nuclei. Furthermore, one zona pellucida could be seen around the nucleus, and the surrounding cells were heavily stained; the spinous process disappeared, namely the lytic cells of the spinous process, which exhibited the characteristics of PV (a pathological section of the selected slice is shown in Figure 3). Indirect immunofluorescence revealed positive results for PV-circulating antibody (mean titer of 1:1280). The patient received glucocorticoid therapy, immunosuppressant agents, antibiotics, and supportive symptomatic treatment, after which his symptoms were controlled. 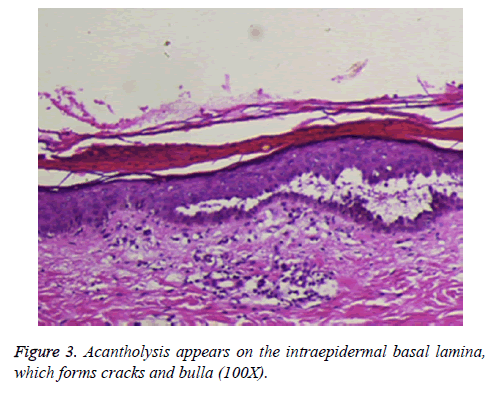 Figure 3: Acantholysis appears on the intraepidermal basal lamina, which forms cracks and bulla (100X). PP occurs in a variety of ways including oral transmission, which is the most common, as well as skin exposure, mucosal contact, and through open cuts or wounds, which would also lead to systemic toxicity. In most cases, oral PP is associated with the following symptoms: oral burning, erosion, and ulceration of the oral mucosa and esophageal mucosa; and nausea, vomiting, abdominal pain, diarrhea, possible hematemesis and hematochezia or gastric perforation, and acute pancreatitis. A few cases of oral poisoning have hepatomegaly and/or jaundice with abnormal liver functions and possible liver failure. Regarding the Central Nervous System (CNS), some cases report dizziness and/or a headache, while only a small minority of patients had hallucinations, fear, convulsions, coma, and other CNS symptoms. Lung injury is very common and serious, manifesting as a cough, chest tightness, shortness of breath, cyanosis, dyspnea, diminution of respiration, and pulmonary dry and moist rales. Most causes of death following oral ingestion of large quantities of paraquat were due to acute respiratory distress syndrome, with death in many of these cases occurring within a few days, since pulmonary edema and hemorrhage always occurred within 24 h. While subacute cases (only small quantities of paraquat were taken), with the main manifestations of chest tightness at 1 week and dyspnea at 2-3 weeks, usually died of respiratory failure. A few cases had complications such as pneumothorax, mediastinal emphysema, toxic myocarditis, and pericardial bleeding. This process changed gradually, and in the first week, the injury of the lung included marked thickening, interlobular fissures, and exudative changes or consolidation, which only occurred at the bottom or peripheral of the lung, sometimes with pleural effusion. After 1-2 weeks, the process accelerated with the injury of the lung becoming serious with patchy infiltrations or ground glass opacifications, which were distributed in bilateral hilar regions and middle lung fields. The patient would often die of severe hypoxia. Paraquat can be absorbed through the skin, causing skin burns when exposed to light (including erosion/ulceration), and in combination with a bacterial infection, abscess and cellulitis may also occur. Long-term clinical studies have also demonstrated that repeated skin contact with paraquat can cause death . One study from the Israeli poison information center reported on 15 cases of a single exposure of either the skin or eye to paraquat solution and found the exposure of healthy skin to paraquat only caused local lesions and not a systemic reaction as determined by laboratory analysis of urine and serum samples. One recent study reported on two cases of dermal toxic laxation induced by the skin contact with paraquat [5,6]. When paraquat is inhaled, it can be quickly absorbed and stored in multiple organs, and its blood concentration quickly reaches a peak level and then begins to decrease. The plasma concentration of paraquat reaches a peak level after 2 h and is absorbed mainly in the jejunum and distributed throughout the body within 6-12 h, with a maximum concentration detected in the lungs (i.e., 10-90 times that of blood) and kidneys, followed by the liver, and a minimum concentration detected in the heart. The concentration decreases significantly after 24 h , and the concentration of paraquat cannot be detected approximately 3 d later . The concentration and duration of paraquat in various organs reflect the extent of the damage to the respective organ. Lung tissue is the primary target organ of paraquat, and pulmonary fibrosis and acute lung injury are the main lung diseases caused by paraquat . The patient had a clear history of percutaneous absorption of paraquat, and subsequently, he had breathlessness and chest tightness; meanwhile, a lung CT also revealed a lung fibrosis in combination with PV. Studies have shown that PP can alter the transcription of Immunoglobulin M (IgM) and serum complement C3 in fish. For example, IgM and C3 are generally downregulated; however, lysozyme is either downregulated or upregulated, suggesting that paraquat may interfere with the functioning of the immune system in fish. It was further indicated that acute paraquat toxicity may strongly activate inhibition of the immune system in fish, thus leading to immune dysfunction and declining immunity [10,11]. The toxic effects of paraquat on the mouse immune system has also been demonstrated, and the results showed that high-dose paraquat (1 mg/kg) in mice inhibit cell-mediated and humoral immunity [12,13]. Recently, a case report concluded that a patient with Acquired Immune Deficiency Syndrome (AIDS) could obtain a better treatment efficacy after PP and proposed that the contribution of AIDS to the treatment of PP is worthy of future study. Therefore, it can be concluded that the effect of PP on the immune system and relevant mechanism are still research hot spots . In conclusion, the patient in this study was admitted to our hospital for skin contact with paraquat in combination with PV. Because skin contact with paraquat plays an important role in the occurrence and development of PV, the possible mechanism may be concluded since PP reduces the patient's immune system. However, the in-depth mechanisms between paraquat and immune system still need further investigation and exploration. Therefore, PP, as a causative factor, should be highly questioned and investigated in relation to PV. Bertolote JM, Fleischmann A, Eddleston M, Gunnell D. Deaths from pesticide poisoning: a global response. Br J Psychiatry 2006; 189: 201-203. Klein-Schwartz W, Smith GS. Agricultural and horticultural chemical poisonings: mortality and morbidity in the United States. Ann Emerg Med 1997; 29: 232-238. Grando SA. Pemphigus autoimmunity: hypotheses and realities. Autoimmunity 2012; 45: 7-35. Okabe M, Nishimoto S, Sugahara T, Akiyama K, Kakinuma Y. Oral administration of paraquat perturbs immunoglobulin productivity in mouse. J Toxicol Sci 2010; 35: 257-263. Hoffer E, Taitelman U. Exposure to Paraquat through skin absorption: clinical and laboratory observations of accidental splashing on healthy skin of agricultural workers. Hum Toxicol 1989; 8: 483-485. Xu W, Wang L, Wang Q, Li XH, Hu D, Li C, Wu T, Mohan C, Peng A, Shi Y. Paraquat poisoning followed by toxic epidermal necrolysis: a report of two cases and published work review. Dermatology 2015; 231: 209-212. Chen JG, Eldridge DL, Lodeserto FJ, Ming DY, Turner KM. Paraquat ingestion: a challenging diagnosis. Pediatrics 2010; 125: e1505-1509. Smith LL, Rose MS, Wyatt I. The pathology and biochemistry of paraquat. Ciba Found Symp 1978; 321-341. Dinis-Oliveira RJ, Duarte JA, Sanchez-Navarro A, Remiao F, Bastos ML, Carvalho F. Paraquat poisonings: mechanisms of lung toxicity, clinical features, and treatment. Crit Rev Toxicol 2008; 38: 13-71. Ma J, Li X. Transcription alteration of immunologic parameters and histopathological damage in common carp (Cyprinus carpio L.) caused by paraquat. J Biochem Mol Toxicol 2015; 29: 21-28. Ma J, Li Y, Niu D, Li Y, Li X. Immunological effects of paraquat on common carp, Cyprinus carpio L. Fish Shellfish Immunol 2014; 37: 166-172. Ma J, Li X, Li Y, Li Y, Niu D. Toxic effects of paraquat on cytokine expression in common carp, Cyprinus carpio L. J Biochem Mol Toxicol 2014; 28: 501-509. Riahi B, Rafatpanah H, Mahmoudi M, Memar B, Brook A. Immunotoxicity of paraquat after subacute exposure to mice. Food Chem Toxicol 2010; 48: 1627-1631. Tsai JL, Chen CH, Wu MJ, Tsai SF. Paraquat poisoning in patients with HIV infection: a case report and literature review. Medicine (Baltimore) 2016; 95: e3350.